While Portland to the south has a reputation for being quirky, Seattle has its own weird side, too. 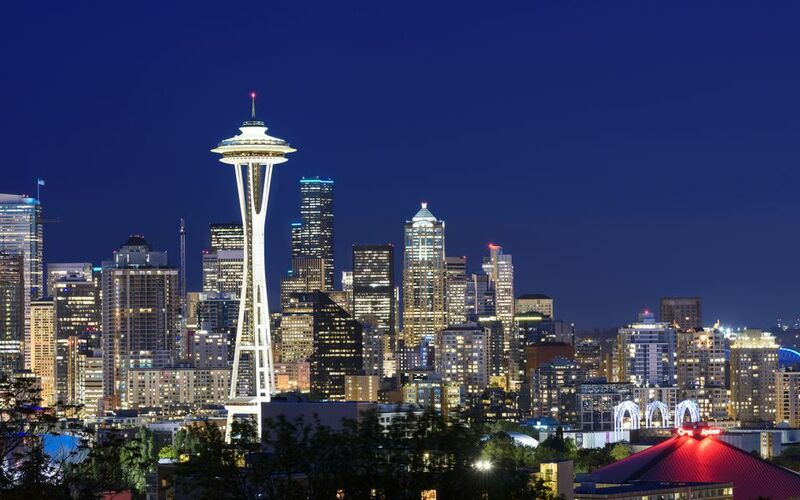 Aside from a diverse and sometimes quirky populace, Seattle has plenty of weird and unusual attractions ideal for filling a lazy afternoon or impressing out-of-towners. From a strange store that sells bacon Band-Aids to a giant troll under a bridge, cowboy mummies hanging out near the Seattle Waterfront to a wall covered in gum, the Seattle-Tacoma area is full of weird and wacky things to see outside of the usual rut of run-of-the-mill attractions. Archie McPhee is the most novel of novelty shops you’ll likely ever find—and certainly the queen of novelty shops in Seattle. Filled with items you most certainly never knew you needed, Archie McPhee is a must-see stop on a tour of the weird in Seattle. Treasures you'll find inside Archie McPhee include a unicorn horn for your cat, a mustache for your baby, bacon bandaids, and just about anything else you can think of. Even if you’re not a fan of novelty shopping, stop into this iconic Seattle store and take a look. Bob’s Java Jive looks like a giant coffee pot, and while you might assume it’s yet another espresso stand, it actually houses one of Tacoma's coolest dive bars and restaurants. Designed by Bert Smyser and constructed as the Teapot Restaurant in 1927, the teapot wasn't established as Bob's Java Jive until the 1950s. Now, Bob's Java Jive hosts karaoke seven nights a week and also regularly features live music and DJs. While you can always admire the outside of Bob's, you'll have to come during business hours to enjoy some cheap food, beer, and karaoke fun. The Fremont Troll lurks underneath the north end of the Aurora Bridge near North 36th Street, paying homage to the mythical creature of fairy tale lore. Created by artists Steve Badanes, Will Martin, Donna Walter, and Ross Whitehead, the troll was installed in 1990. The Fremont Troll is made of steel rebar, concrete, wire, an old hubcap, and an actual Volkswagon Beetle. Tourists can stop by and snap a picture of the troll, but there are no official amenities at the Aurora Bridge to see this attraction. Located on Pike Place Market's lower floor in downtown Seattle, the Giant Shoe Museum is a wall of vintage coin-op displays that prides itself in being the world's largest collection of giant shoes. The Giant Shoe Museum looks like the entrance to a circus sideshow, and for a few cents, you can get a peek at a shoe worn by the world’s tallest man, some shoes of mystery, and the greatest shoes on earth. The quirk is high and is coupled with some vintage charm, which makes this quick detour great for a pitstop during your shopping trip to Pike Place Market. In the forest on Vashon Island is an odd sight—a bike that goes right through the middle of a tree, about 12 feet off the ground. However, the Bicycle Tree is a little hard to find, so you'll have to ask a local how to get there from Vashon Highway. When you're asking for directions, you'll also likely hear plenty of legends about how the bike got there. Some say that a young man chained the bike to the tree and head off to war while others say that someone put the bike into the tree somehow. The official story is a little different, though, and a little less exciting. Apparently, the bicycle was abandoned in the woods long ago and a tree simply grew around it over time. Still, this unique attraction is a great spot for a picnic—and an excellent excuse to spend some time in nature on Vashon Island. Fremont is home to a few of Seattle’s coolest and weirdest attractions, including the 16-foot-tall bronze statue of Vladimir Lenin. Sculpted by Bulgarian Emil Venkov for the Soviet and Czechoslovakian governments, the bronze colossus was just one of many large-scale sculptures used as part of the Communist propaganda machine. The way the statue came to Fremont is that a local man named Lewis E. Carpenter was working in what is now Slovakia and found the statue ready to be discarded in 1989. Carpenter saved the statue and after much effort and expense, brought the statue to the United States. However, he died before he could do anything with it, but his family placed it in Fremont according to his last wishes. The Vladimir Lenin Statue is located at the corner of North 34th Street and Evanston Avenue North in the Fremont neighborhood of Seattle. You can swing by and snap a quick picture on your way to see the Fremont Troll. There is another Cold War-era relic you can find in Fremont—a 1950s rocket fuselage that was formerly perched atop AJ’s Surplus in Bell Town. However, when the news reported that this quirky artifact was being dismantled, the Fremont Business Association acquired the Rocket and set it up on Evanston Avenue. The Rocket is another great destination for a quick picture and is located just one block up Evanston Avenue from the Lenin Statue. Standing at 53 feet tall, this giant monument to the Cold War was erected atop a building and now bears the Fremont crest and motto: "De Libertas Quirkas," which translates to "Freedom to be Peculiar." The Gum Wall is probably the most disgusting attraction in all of Washington state. It's exactly what it sounds like: a wall where thousands of pieces of gum have been deposited over the years. Passers-by have been sticking wads of gum to this wall since the early 1990s and now there is gum as far as the eye can see. You’ll spot some gum shapes in the mess as well like gum hearts and gum smiley faces, and you can also add your own gum if you please. Ye Olde Curiosity Shop is part of the touristy strip along Seattle’s waterfront and is located on Alaskan Way. The shop sells fun novelties, curiosities, and Seattle souvenirs but also functions as a bit of a museum. The store is home to a number of very cool antiques from narwhal tusks to totem poles to two mummies—Sylvester and Sylvia. Sylvia was found in a cave in Central America but was likely a European immigrant. She was naturally preserved and looks a bit scarier than Sylvester. Meanwhile, Sylvester is one of the best-preserved mummies anywhere; UW Medical Center scientists discovered he was purposefully preserved with an arsenic solution over 100 years ago. While it’s not a wall and it’s said that no one has actually died here, the Wall of Death is an interesting sculpture tucked under the University Bridge near Northlake Way. A huge orange ring reads “The Wall of Death,” just so you know for sure what you’re looking at, and massive spikes rise out of the ground and hold the ring up. Tacoma’s Museum of Glass is a modern and beautiful building but still makes sure to keep a little bit of quirk to its façade. As a result, the museum also features a giant cone that towers above the building and provides a major focal point to Tacoma’s skyline. While the Cone looks a bit like a space pod or the Apollo Command Module, it is actually functional and houses the museum’s Hot Shop where glass is blown live on-site during museum hours. The nation’s undisputed largest pair of boots and accompanying cowboy hat are in Georgetown’s Oxbow Park. Originally part of a 1950s cowboy-themed gas station, the sculpture has become a roadside attraction and even made an appearance in “National Lampoon’s Vacation.” Oddly enough, the hat was the gas station building and the boots served as the restrooms. In more recent years, the Hat ‘N’ Boots have become a symbol of the Georgetown neighborhood, and they're now located in Oxbow Park for all to enjoy.